1. Gingerbread Homes for Animals, A series of gingerbread houses designed for animals by New York City pastry chefs will be on display from Thursday, December 1, through Sunday, December 11, 10:00 am to 5:00 p.m., at the Charles A. Dana Discovery Center at Central Park, 110th Street between Fifth and Lenox Avenues. A raffle of the houses will benefit at-risk animals. Call 212.860.1370 for more information. 2. To AOC or Not To AOC…? Susan Sturman, former Assistant Director of the Ritz-Escoffier cooking school at the Paris Ritz, consultant to the New York State Cheese Guild, and member of the American Cheese Society, will lead a tasting and a discussion about the pros and cons of Appellations d' Origine Controlee (AOC) classification of cheeses, Monday, December 5, 6:30 p.m. to 8:00 p.m., at Murray's Cheese, 254 Bleecker Street. $50/person (212.243.3289, ext. 25). 3. Dining With the Gods, Andrew Dalby will give a lecture, viewing, and tasting of the culinary culture of ancient Greece, presented by the Culinary Historians of New York, Monday, December 5, at Sotheby's Institute of Art, 1334 York Avenue, 6:00 p.m. to 8:00 p.m. Members/$25, Guests/$35/person, RSVP required (212.334.4175). 4. Sake Tasting, the Asian American Federation of New York will present a sake tasting and dinner on Tuesday, December 6, 6:00 p.m. to 9:00 p.m., at Megu, 62 Thomas Street. $100/person in advance, $125/person at the door (212.344.5878, ext. 23). 5. Pastries & Champagne at Fauchon, the French Institute Alliance Française (FIAF) will present a champagne and pastry tasting led by Fauchon Executive Pastry Chef Florian Bellanger, who will discuss the history and preparation of the pastries served, Tuesday, December 6, 5:00 to 7:00 p.m., at Fauchon, 442 Park Avenue. $60/FIAF members, $75/non-members. Seating is limited, and tickets must be purchased by Friday, December 2 (646.388.6669). 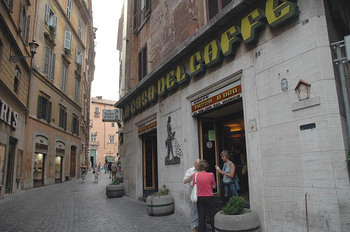 When we last left off, we were on a pilgrimage to three of Rome's holiest food sites. First stop: A visit to La Casa del Caffe Tazza D’Oro, coffee roaster and café located just around the corner from the Pantheon. 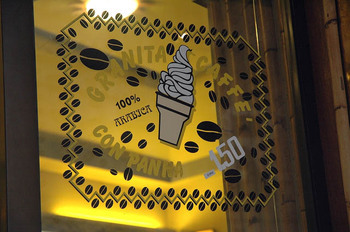 Better known simply as Tazza D’Oro, the cafe, established in 1946, is a gastro-tourist draw not only for its coffee, but also for its granita di caffè con panna. Every recommendation for traveling in Rome -- whether given personally or found in a guidebook -- demanded a visit to this place for this special dessert. As we circled the streets surrounding the Pantheon, I suddenly came upon clusters of happy people dipping spoons into cups filled with black and white deliciousness. We had found our destination. Just one and a half euros buys you a cup full of the tiniest crystals of lightly sweetened frozen espresso layered with whipped cream. 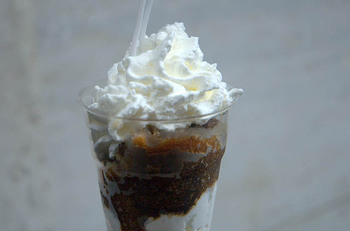 Imagine a frozen, slushy caffe shakerato with cream, and there you have the granita di caffè con panna. Perfectly bittersweet, creamy, and luscious, the granita deserves its hallowed reputation. 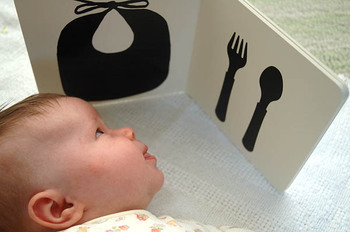 The Infant Gastronomic Training Program has begun in earnest, and, as can be seen above, Anya is already making excellent progress with her readings on basic dining gear and apparel (just look at the intensity of her gaze at that bib, fork, and spoon). All of this training -- which is critical in these early stages of gastronomic development -- has demanded an extraordinary amount of time and attention. But, don't fear, The Food Section will return with its regular menu of postings after the Thanksgiving holiday. For the latest information on site updates, be sure to sign up for the TFS mailing list if you haven't already. In the interim, an indulgence in some unabashed baby photoblogging . . . after the jump. Today's New York Times includes an article I wrote on the current popularity of pork -- as ingredient, subject of books and blogs, and inspiration for art and design projects high and low. You can find the article online and in print in the Fall 2005 issue of T:Living, The New York Times Style Magazine. 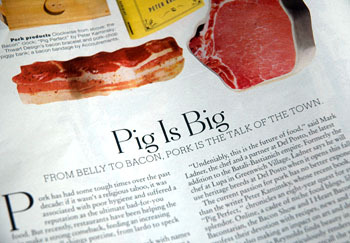 »New York Magzine's preview of Del Posto. »Pig Perfect, by Peter Kaminsky. »Niche food blogs: Bacontarian, The Bacon Show, and I Heart Bacon. »Artist Victoria Reynolds' work can be found at the Richard Heller Gallery. »Thwart Design's bacon bracelets and pork chop piggy bank. »Matty Sallin's Wake n' Bacon clock. »Whole Hog: How to Eat a Big Fat Pig, an online cooking journal by writer Heather Irwin. »The Kentucky Bacon Oral History Project, the latest oral history project by Southern Foodways Alliance oral historian (and TFS contributor) Amy Evans.